Are you tired of your stretching routine? Have you heard of a foam roller? 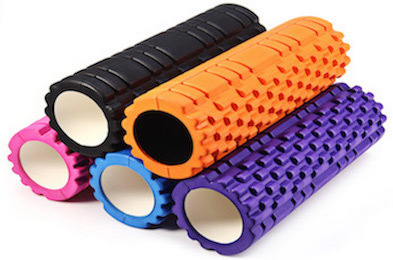 A foam roller is a cylinder of foam that can help relieve your muscles of knots and pains through a technique known as self-myofascial release (SMR). Foam rolling reduces tightness in your body by stimulating the nervous system to relax tight tissues. Many believe foam rolling should be a ritual before a workout; however, it is most efficient after training or the day following. Contrary to popular belief, foam rolling is not going to improve your strength, endurance, flexibility, or mobility but, it can improve soft tissue resilience. Additionally, foam rolling does not break up scar tissue due to its inflexibility and lack of elasticity compared to normal muscle tissue. Foam rolling has its place and should not be thought of as a cure-all, but can be used as a technique to relieve and massage your muscles.